As forecast, we got a light silver coating on all the grass. I had hoped that it wouldn´t be bad enough to knock out the apples, and got up very early so I could go and pick more before work. Turned out very well, and now have another green Waitrose bag (fortunately they are reinforced!) full of them. Bit peeved that the courgette that was growing in the dahlia in my last lot of photos has been nicked by some swine. I was looking forward to one last fresh one. Humph. Put a dampener on the exhilaration of a gorgeously clear morning. Heavy frost overnight this time. Bet the dahlias are all black now. Must cut them down tomorrow. Very frosty again, followed by a beautiful day. Went up to the lottie fairly early with the strimmer and fork, and carried just the strimmer up to begin with. Cleared all the paths (those which hadn´t been kindly done by Loraine) and then raked the grass up. The compost bin is now rather fuller than it was. Can´t quite get the dead courgettes into it! Took those tools back to the car and swapped them for the fork and trug. 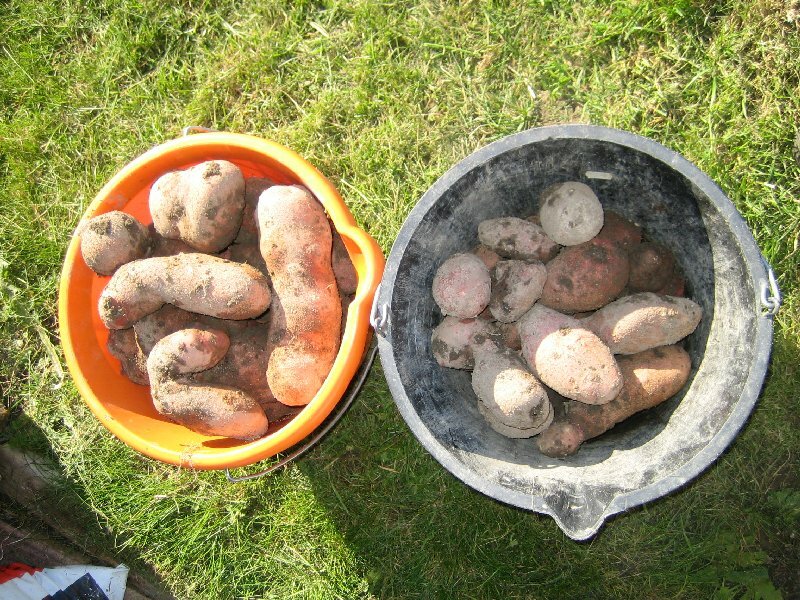 Soon realised that the maincrop potatoes were going to fill more than one bucket, and eventually ended up with two. Most were the Sarpo Miras, finally frost-blackened this week, and most of those were huge, skittle-shaped tubers. A few ended up snapped (!) because I hadn´t realised the small end was there when I pulled at the larger bit! Never mind, they´ll get used first. Dug up a couple of leeks to go in the inevitable leek and potato soup. They really do respond very well to being planted deeply - a foot of straight, mostly white stem. A few of the Ratte and Pink Fir Apple potatoes were slugged, sadly, but the Sarpos were again ignored. 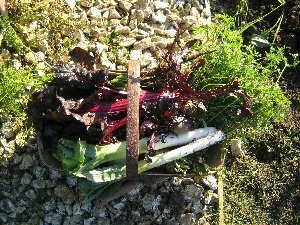 Dug the salad blues up too - a very decent crop from a volunteer - though some were suspiciously squishy (but not smelly) so may have been either too close to the surface (so froze) or just got hit by a virus, which I know they´re prone to. I cut them back before blight hit the haulms. Dunno. Cut the manky ends off and left them to callus over in the sun. I shall watch them, and with luck they´ll give us the blue roast potatoes we like at Christmas! Also picked the other blues, the vitelottes. Fine as long as you don´t mind tiddlers. Almost unpeelable, sadly, as they are so small. And I expect volunteers as they´re so dark they´re hard to spot in damp soil. Next the carrots. They badly needed thinning, and though I don´t think they´ll grow much from now on, you never know, and I should have thinned them a few weeks ago. Still, now have a very nice bunch of 2" long baby carrots, which I´ll scrub and freeze, probably for Christmas. And a couple of larger ones which sneaked up on me. Also dug my first parsnips - the usual multi-legged one from the first sowings of Tender and True, and a much more conical one from the Avonresisters, which was also notable for actually not resisting at all and being cankery. Or should that be cantankerous! More soup, probably! . 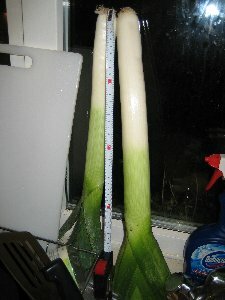 30cm leeks - plant deep! Dave the manure man turned up halfway through the afternoon needing to be let in to deliver a load to someone else, so took two buckets of spuds back to the car as I did so. Glad I did - at least I wouldn´t have to try and carry everything at once! Took another whopping red cabbage when shutting the gates after he´d driven out again. Cut one for Jools as a thankyou for helping me plant the monsters back in the spring, and another for us as I´d spotted another centre-exploded one. (Jools´ cabbage turned out to be 3.1kg - nearly 7lb! Didn´t weigh ours as a fair bit had to be cleaned of woodlice and was binned). The dahlias are now black, and need manuring. Perhaps I ought to have plonked the strimmed grass on them, but I have got shot of the sage bush from the flower beds to a willing taker: not really needed there given how much other sage I have! Also had a visit from one of the older plotholders wondering if he might grab some windfalls - so more apples now have a home. I ate two for lunch! (and a few of the last raspberries - fresh rasps in November - mmmm! 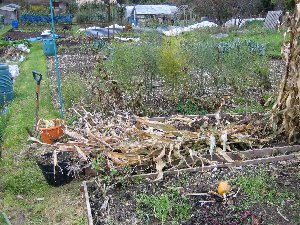 That reminded me to do something about the summer fruiting canes, and so have removed the dead ones from the row and pulled the netting off. Should have done that ages ago, but it´s really been a harvest and a half and I´ve not stopped picking for weeks, and not had the time to actually do maintenance. 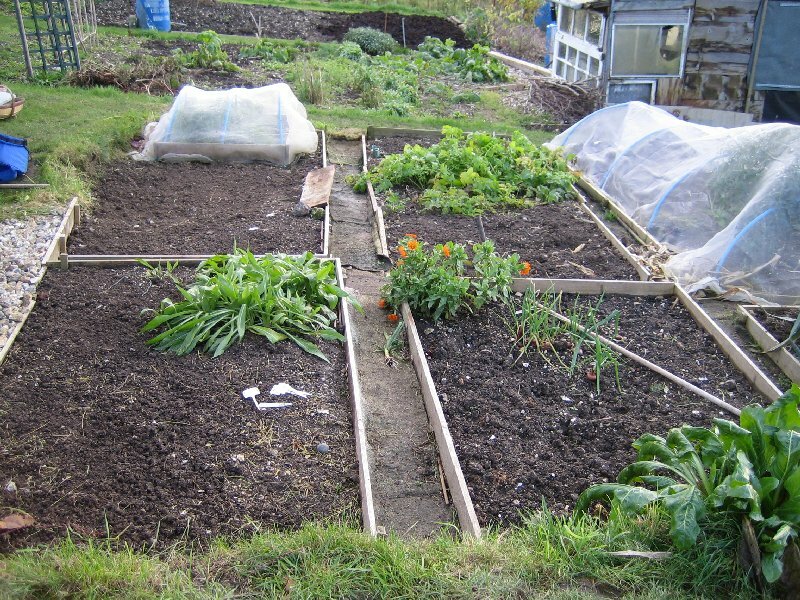 So that spurred me to finish off by weeding one of the beds I need for overwintering veg. Apart from the resprouting onions (which are going for salad onions), I now have a speedwell-less middle small bed on plot 2. That was slated for spring cabbages, which are still hanging on in the back garden. They will be planted under cloches, which might give them an edge (as well as stopping the devilbirds from getting in!). They´ve two chances after all! An odd day - original forecast was rain rain rain but it turned out grey but dry after a damp night. Took the chance to get out after lunch and finally start some serious weeding and clearup. Started with the sweetcorn bed - the full size cob plants are smaller than the mini cob plants - and a heck of a lot easier to get out of the ground. Managed a few of the larger plants but then decided to give my back a breather and went to pick the soya beans. Got a fair few more than last year. Then got started on the old courgettes. The haulms mostly went into the compost bins, though not all of them fit! Handweeded my way across the bed, then checked what was supposed to be in there. Turned out to be the overwintering onions so they´ve at last somewhere to go. Checked where the garlic were to go and it is the dwarf/soya bean bed. Did that one next, so that´s sorted all of the urgent clearing. Poor old sweetcorn looks terrible, that´s the trouble with this time of year - the clearing and weeding is a pain and it looks worse before it gets better, but it´s a relief when it´s done! Finished off by starting to clearup the runner beans. They had gone straight to seed and so a lot of beans were sitting in dried pods. Shelled them into a container and then cut the haulms off at the base so I could leave the roots in place, then cleared the top growth into a pile which I´m not sure what to do with! The compost bin´s rather stuffed... by then it was going dark so took a pic and went home. The start of a glorious weekend weatherwise, and exhausting physically. Yesterday we had over an inch of rain, so despite the plots being well-drained, it was still very claggy and hard to work. Spent the morning hoovering leaves at home (and blowing up the leaf hoover, drat!) then packing the unhoovered ones into bags. Bit annoying, as they won´t rot as fast now. But can´t be helped. 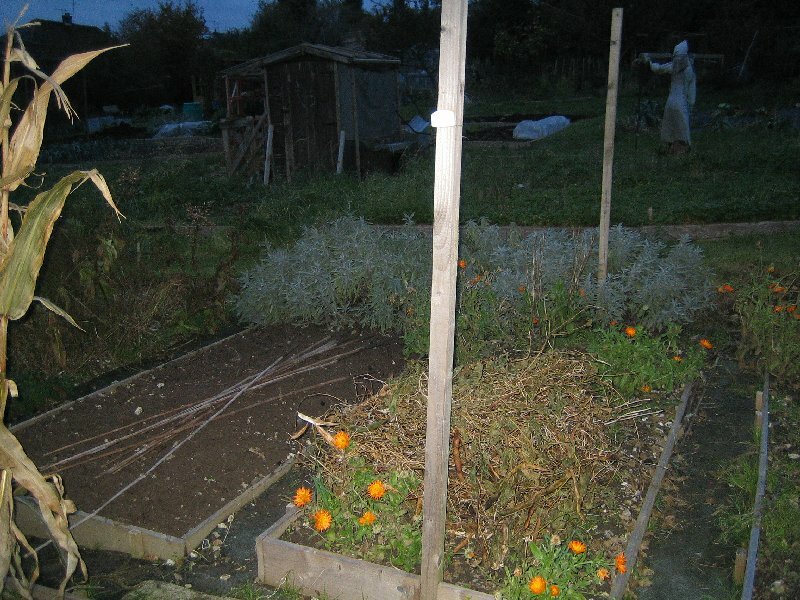 Lugged three bagsful up to the plot and dumped them into the leaf bin (after evicting a load of apples from it). Picked up a lot of newly-dropped apples and shoved them into the second compost bin, now the brambles have retreated a bit. Then got going on the weeding. There were some really bad bits, with lots of matted grass and speedwell, and typically the worst ones were where the ground was dampest. Started off by attacking the end of the garlic bed, and found that the leftover bulbs that never made it home had rooted. Ooops. Weeded as far as the firebox but it was still claggy around it. 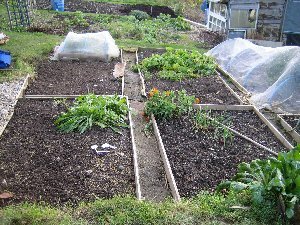 Weeded the parsnip bed and cleared the sweetcorn. Chris was up, and we rescued the old carpet off her plot end and put it where the potatoes had been, so that won´t grow any new weeds overwinter. Sadly the other piece of carpet is disintegrating and so I´ll have to get more at some stage. Need new paths as well! It doesn´t sound like much but sitting on a kneeling pad, shuffling about with a hand fork does get out all the weeds but takes time. I find it better than digging, as that just replants surface weeds. Chris prefers forking over the ground and hates the idea of handweeding. I learned to do it when my back was really bad, and it allowed me to get on and do stuff. Now I prefer it! Left when the sun set and the temperature dropped like a stone. Dawned very frosty after a clear night. A lot of the ground was still frozen and so hadn´t drained as much as I´d hoped it would. Lugged up the last three bags of leaves (and noticed a load more have floated down already, so there may be more!) Today´s major attack was the old onion bed, full of onions that didn´t get picked as they were rather too small. Next time I don´t care, they´ll come up anyway (and I won´t trust Sir to do it!). But they have given me a bucketful of onion shoots, which will double up as spring onions in stir fries, so won´t be wasted. Took ages to get the weeds out - the bindweed and couch was particularly bad there. But in the end, all that was left was some unbolted ruby chard and a verbascum. I´m a softy. That could do with coming out but I need somewhere to put it! That timed things nicely for lunch, then it was the two beds I´d been avoiding as they were wettest - the area by the old firebox and the bed directly in front of the shed. Started with the area in front of the shed by the raised carrot box. This required sitting on a plank and weeding from the centre, since the path on the upper side is too high to be able to reach much. Gradually got the better of it, though a lot more soil than I´d hoped for ended up stuck to the grass roots and in the bucket. Found a funny larva while I was at it - either a beetle larva or a cutworm. Without a book, I didn´t want to kill it without knowing what, so left it on the surface. It can crawl back under the soil or become lunch for a bird I expect. Then the last bed (or that´s what I thought...) - firebox - moved it onto the grass path and then had to pick up a lot of rusted bits of box liner that I´d tipped out onto the soil with the gunk last week. Put the ex-contents of the box into a plastic bag to get dumped, then gradually worked my way along the bed getting out the bindweed. There´s a lot of stone at the end where the box was - this was adjacent to the area I´d dubbed the rock face back in the spring, and I will have to deal with it in a similar way, i.e. excavating away at the bottom and getting shot of the stones. Then I´ll put manure into the subsoil bit and shift some topsoil in from elsewhere. It´s due to get spuds next season so I need to have a nice deep soil! Then I walked round the shed and realised I´d forgotten the tomato bed and the daffodils. Argh. The daffs weren´t bad - apart from several baby docks which came out very rapidly. There were a few in the tomatoes too, which were also removed, but it was getting very cold as the sun had gone behind a cloud, and I was anxious to be off. What´s left in there won´t hurt, so duly left it. I have no idea when I´m going to be able to get back up - the next weekend without something going on is in January, but hopefully I´ll be able to grab a day off when it´s fine and go to do the last bits of tidying plus getting more carpets. I suspect there will be occasional dashes up for some leeks or parsnips. But in the meantime, the beds are looking presentable (or are still occupied) so I can leave them in the hope they won´t get too overrun by the new year. Still in the ground - one lone red cabbage, leeks, white cabbages, scorzonera, purple sprouting broccoli, parsnips, carrots and spring onions. And assorted pot marigolds!